Ramadhan, the month of fasting starts today. As much as I am eager about going for night prayers and reciting the Holy Quran, I can’t deny the fact that I am also looking forward to buy some nice outfit for my festival Eid. Can I? To buy new dresses and accessories, with fasting on and raining on n off, I feel not to go out and eri erangify egapatta shops.. instead I decided to stay at home and make the festival purchase in my comfort zone. By now you all must have come to know how much I enjoy shopping.. and yes it also easily makes me go crazy. Well, not only me but also the one who accompanes me :P So I decided this Ramadhan, to give them some peace ;) Also I am not gonna make shopping mood fill my head instead let me indulge in religious stuff. Talking about online shopping, I must mention about a site I discovered. 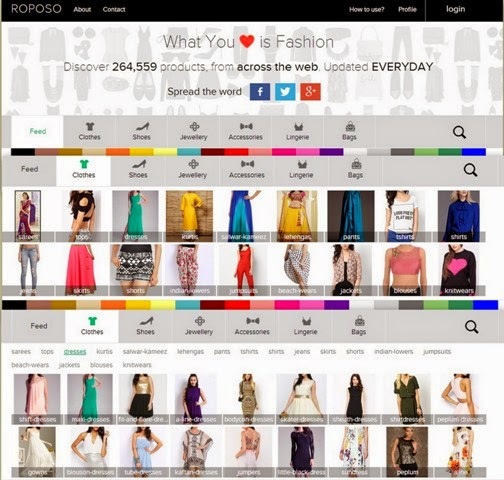 Have you read my post on this awesome web mall - online stores all under one roof @ Roposo.com? If not read and get ready to Stay In Trend With Roposo. So far I haven’t yet come across any site in India other than this as a search engine for fashionable clothes and accessories. This is exactly where we can discover trending women’s fashion products that match to our taste from many web stores like Limeroad, Flipkart, Myntra, Mango etc. Today’s post is going to showcase one of its interesting features - Product Categorization and also one of my favorite lists I have created there as a Fashionista @ Roposo. Yep, I am so glad to be a part of their social site for the up and trending fashion. Talking about the detailed product categorization, all the categories are listed in their homepage itself. For example, under the section Clothes, we can get to see lots of different categories. Like say, Dresses, Shorts, Sarees, Kurtis.. etc. and if we click Dresses, we will get lots of option to choose from too, which is way easy to select what we need. And once we sign up with Roposo, at the time of window shopping, we can even like the products and store it for later shopping purpose under the default list, Things I Love. In each profile, we will get to see an option called ‘Discounts’, where we will be notified with the offers n sales for that products we heart. <3 In such way we will be notified with the offers from various online store. Isn’t it awesome to get notified on our favorite items? As the fashionistas listing their favorite and trending products, we will receive the Newsfeed every minute jus like that in any social networking sites, from which we can get to know what is trending currently. Btw, I got inspired from their collections and so I am trying to create few interesting lists based on A-Z of fashion and styles. Let me showcase here the first alphabet today. An Asymmetric style is a great style for revealing just the right amount of our skin and I think this is apt for refreshing summer collection. Listed here are some of my favorites I picked from clothing section @ Roposo. And hey did I say that I won a contest they run in Twitter page? I received a beautiful piece of jewelry as a token of appreciation. I really had so much fun taking part in it and also got a chance to interact with other people who are interested in fashion and style. Stay tuned and get inspired with more interesting styles at their Twitter handle - Roposo Love. Looks like an amazing website Meera!